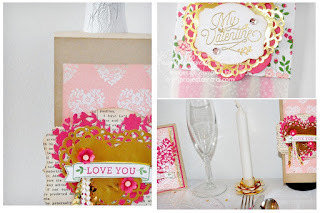 Just Julie B's Stampin' Space: Romantic Dinner Ensemble! Valentine’s Day is approaching and the restaurants will be crowded! Why not plan to stay in the comfort of your own home with this Romantic Dinner Ensemble? Surprise your Valentine with all of the trimmings! You can eat dinner by candle light with taper candles and custom gold rose candle holders, while enjoying the beverage of your choice with a decorative bottle topper. The place setting will be perfect with coordinating silverware sleeves and a matching card for your sweetheart. 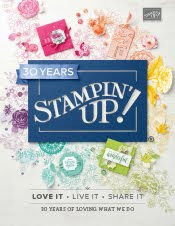 Add some scattered sequins and heart shaped gold doilies for the finishing touch. This sweet project was made by Julie Warnick, and you can get her tutorial when you subscribe to the month of January over at Craft Project Central. Little Letters Felt Board Birthday Set! Memories in the Making Birthday Cards! It's Time to Celebrate...with Cake! Valentine 12 x 12 Sampler & Square Card! Perpetual Calendar & Pen Holder! Botanical Gardens Calendar for Class! A Year Full of Memories!